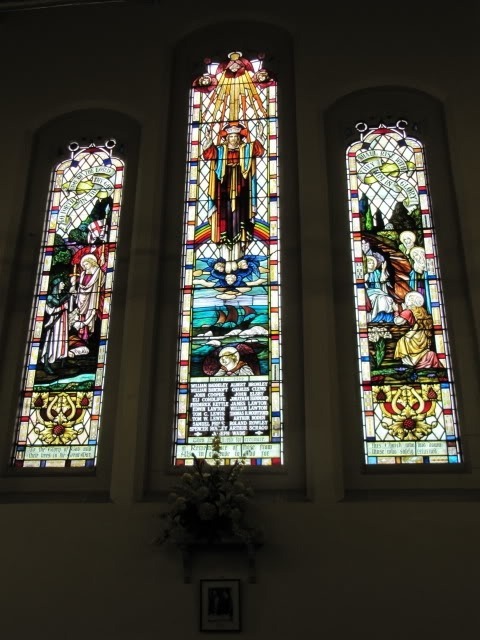 Tom Walker Lewis was born on 18th November 1896 in Wolstanton to Harry Leonard and Maria Lewis. Harry was born in Longport and Maria in Wolstanton. Tom had an elder brother Arthur William. 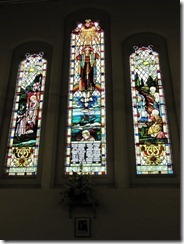 He was christened, presumably at St. Margaret’s Church, on 14th February 1897. According to the 1901 Census, the family were living at the Conservative Club in Lily Street, Wolstanton, and Leonard is working as a Potter’s Printer. By the 1911 Census, they had moved to 93 High Street, Wolstanton. Leonard is now a ‘licensed victualler’ (pub landlord) and Tom is now working as a clerk in manufacturing. 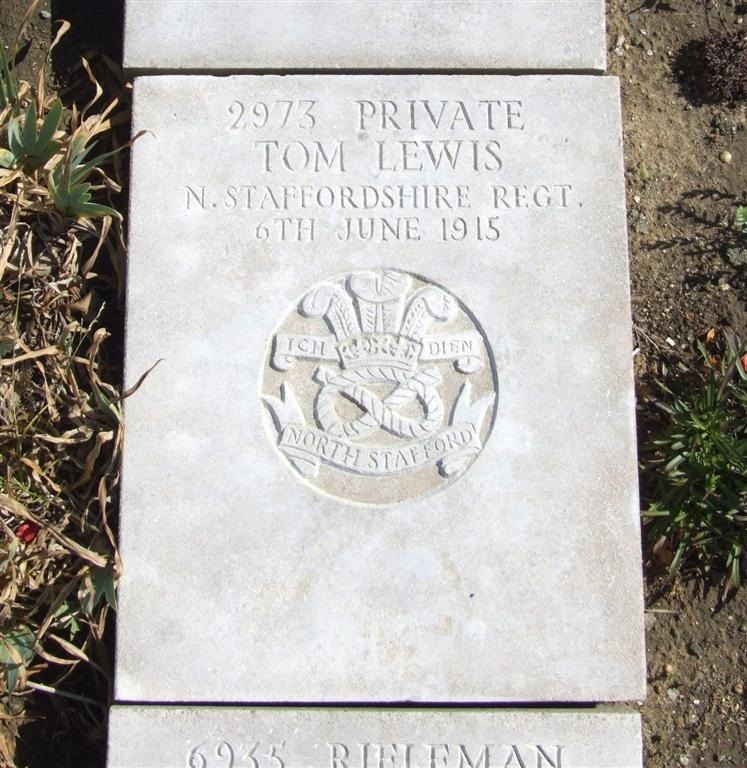 He enlisted in Hanley and served as Private Tom Lewis, 2973 1/5th Battalion Prince of Wales’s (North Staffordshire Regiment), and that’s all we know of his military service. Picture from the Staffordshire Weekly Sentinel Saturday 15th June 1915. 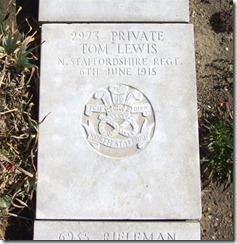 Tom was killed by being shot in the head, and despite some initial thoughts that he would recover, he died on Sunday 6th June 1915 aged 20. There were three reports about him in the Sentinel. Pte. 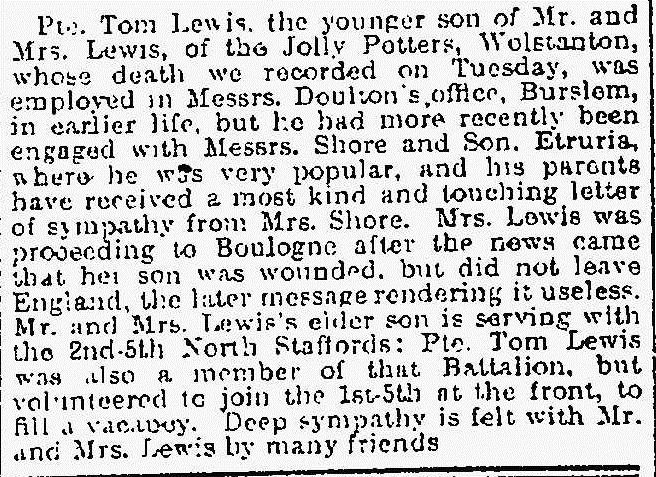 Tom Lewis referred to above, is one of the two sons of Mr. Lewis, the landlord of the Jolly Potters, Wolstanton, on Service. Mrs Lewis proceeded to France to see her son. 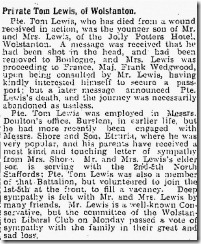 Major Frank Wedgwood has co operated with Mr Lewis in making the arrangements, but Pte Lewis’s death has since been reported. He was shot in the head. Mr Lewis is a well known Conservative, but the committee of the Wolstanton Liberal Club last night passed a vote of sympathy with the family in their great and sad loss. Pte. Lewis was employed for some time in Messrs. Doulton’s office in Burslem. 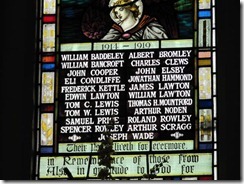 His older brother, who was a clerk in the same office, is serving with the 2nd-5th North Staffs. Pte. 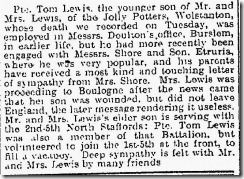 Tom Lewis, the younger son of Mr. and Mrs. Lewis, of the Jolly Potters, Wolstanton, whose death we recorded on Tuesday, was employed in Messrs. Doulton’s office, Burslem, in earlier life, but he had more recently been engaged with Messrs. Shore and Son. Etruria, where he was very popular, and his parents have received a most kind and touching letter of sympathy from Mrs. Shore. Mrs. Lewis was proceeding to Boulogne after the news came that her son was wounded, but did not leave England, the later message rendering it useless. 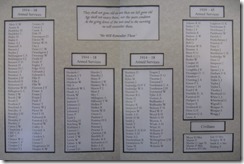 Mr. and Mrs. Lewis’s elder son is serving with the 2nd-5th North Staffords: Pte. 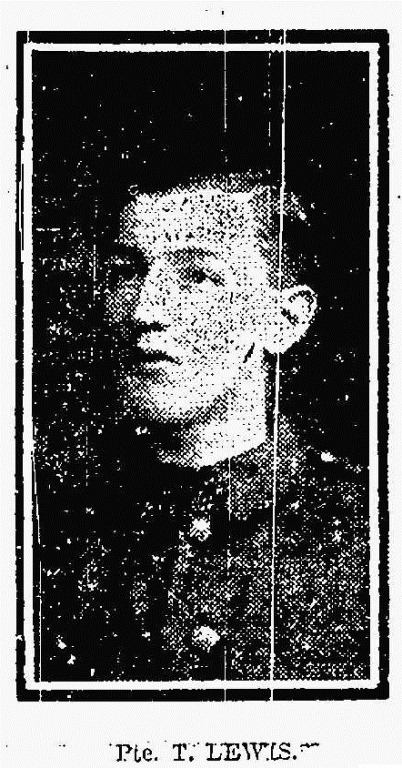 Tom Lewis was also a member of that Battalion, but volunteered to join the 1st-5th to fill a vacancy. Deep sympathy is felt with Mr. and Mrs. Lewis by many friends. Pte. 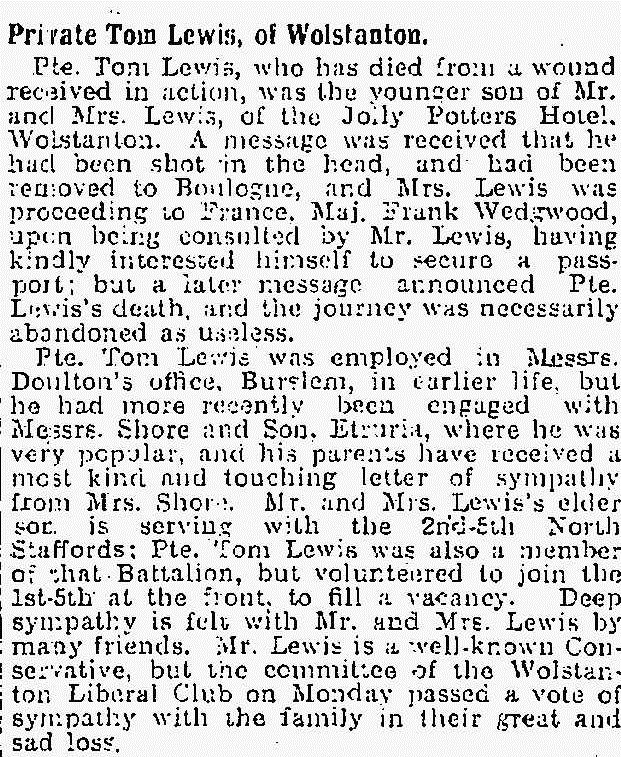 Tom Lewis, who has died from a wound received in action, was the younger son of Mr. and Mrs. Lewis of the Jolly Potters Hotel Wolstanton. A message was received that he had been shot in the head and had been removed to Boulogne, and Mrs. Lewis was proceeding to France. Maj. Frank Wedgewood, upon being consulted by Mr. Lewis, having kindly interested himself to secure a passport; but a later message announced Pte. Lewis’s death and the journey was unnecessarily abandoned as useless. Pte. Tom Lewis was employed in Messrs. Doulton’s office, Burslem, in earlier life, but he had more recently been engaged with Messrs. Shore and Son, Etruria, where he was very popular, and his parents received a most kind and touching letter of sympathy from Mrs. Shore.Mr. 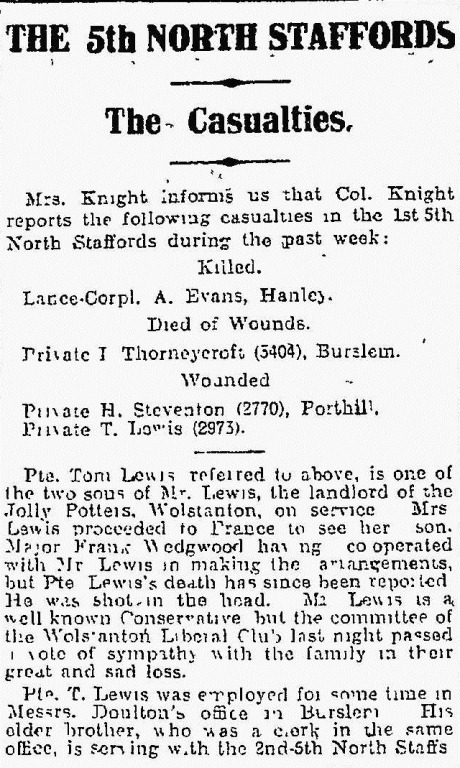 and Mrs. Lewis’s elder son is serving with the 2nd – 5th North Staffords: Pte. 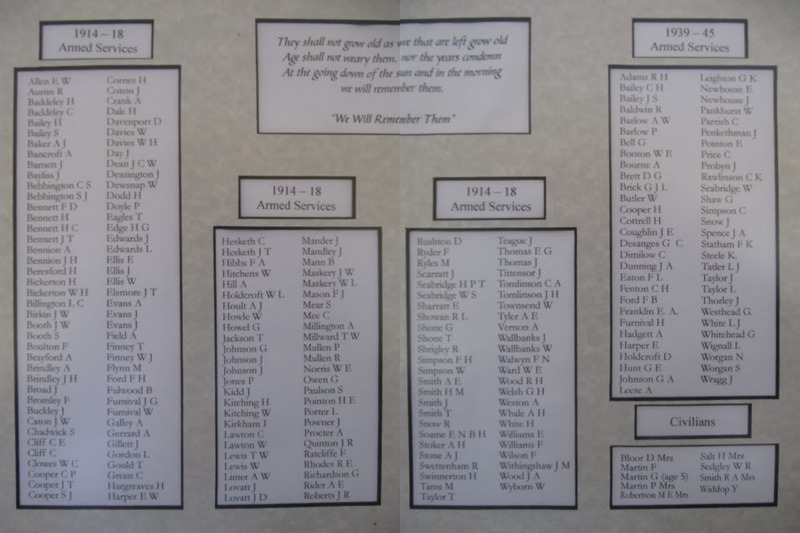 Tom Lewis was also a member of that Battalion, but he volunteered to join the 1st – 5th at the front, to fill a vacancy. Deep sympathy is felt with Mr. and Mrs. Lewis by many friends. Mr. Lewis is a well-known Conservative, but the committee of the Wolstanton Liberal Club on Monday passed a vote of sympathy with the family in their great and sad loss. Tom Lewis was awarded the 1914 – 15 Star, the British War Medal and the Allied Victory Medal. 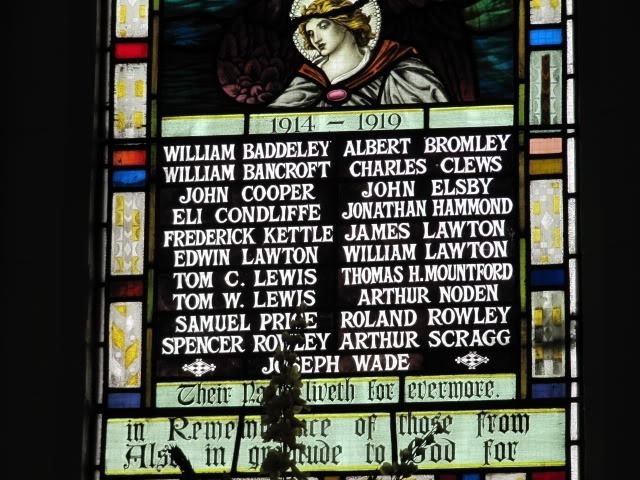 He is buried and commemorated at the Boulogne Eastern Cemetery in France and is commemorated on the Wolstanton Methodist Church Memorial, the Longport Methodist Church Memorial and on our Memorial.